For those of you that don’t know, Leatherman makes really amazing pocket knives in addition to their extensive line of multi-tools. The Crater C33TX by Leatherman is literally the best pocket knife I have ever owned for one reason in particular. 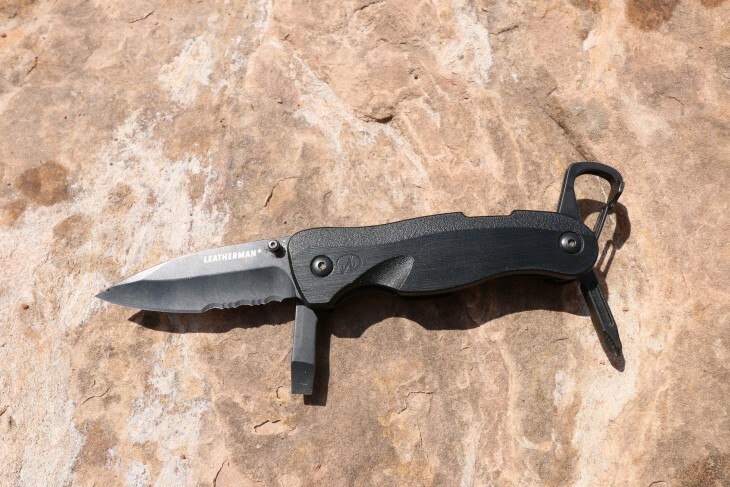 Not only has Leatherman designed and developed an extremely strong, durable, and sharp knife blade, they have added Flat and Philips Screwdrivers. I can’t even count how many times I have broken the tip off of my knife blade because I was improperly using it as a screwdriver. Now, I can protect my knife blade and be prepared for any situation thrown my way. In addition to the screwdriver features, there is also a carabiner and bottle opener for ultimate attachment options. It would really be unfortunate to lose a knife this nice! The closed length of the knife comes in at 3.83 inches, which feels pretty standard as to any other knife I’ve put in my pocket. Considering how durable the Crater C33TX is, I feel as though it is relatively light. Leatherman uses a glass-filled nylon thermoplastic material that is incredibly strong yet keeps the weight down (total weight is 2.36 oz). I can’t imagine ever having a pocket knife in my pocket other than this one. The Crater C33TX is extremely innovative, useful, and most importantly, strong enough to withstand your needs!